The Nissan Altima is one of a few cars that don't encourage buyers to spend a lot more; the base model would need only a rearview camera to cover all the basics we look for in a family sedan. Briskly updated in the right ways, the 2013 Nissan Altima sedan promises good looks and great gas mileage for those who don't mind a CVT. Maturity has its upside--but we'll sure miss the frisky old feel of the Nissan Altima. For most of the past decade and a half, the Altima's been one of the more sporty, scrappy sedans put forth for families. Quick steering, a taut ride, and adventurous styling left it out of mass-market appeal, but since 1998, Nissan's been reeling it in, closer and closer to the mainstream. This year's redesign completes the process: the 2013 Nissan Altima delivers on the priorities of the families that drive it. It's now a thoroughly comfortable, five-star-safe sedan, but it's no longer the sharpest to steer or the quickest to get a grip on the road. With its simplified powertrain lineup, a pared-down and dressed-up cabin that makes way for new infotainment systems, and space-race seats that go long on comfort, the 2013 Altima has gone mainstream, in all the right ways. The new Altima begins life with a new shape, which Nissan says comes from an emotional take on styling, and some advanced manufacturing techniques that enable some complex surfaces on the attractive new body. The front end wears some of the angled, arrowed cues of other Nissans and Infinitis at the headlamps and taillights, while the side glass tapers gradually to a tasteful backstop. The fenders swell out in ways that recall Nissan's compact Juke crossover. The interior's a big contrast: it's conservatively drawn, with straight lines dividing off the center stack of controls from the driver and the passenger. There's also more space left for larger LCD screens for more advanced infotainment systems, a selling point where the Altima's lagged behind the Koreans and Americans. The Altima sedan's still a five-seater, riding on the same 109.3-inch wheelbase it did in the 2012 model year, 191.5 inches long in all. There's not much more room in any direction, and that's fine--the Altima was large enough for almost any family. Nissan's spent quality time on the seats, and it's paid off in very comfortable chairs that hold up for hours on end, at least for the front-seat passengers. On base models, the front seats are adjustable six ways for the driver, four for the passenger. A power driver seat and heated front seats are an option. The rear seats are split 60/40 and fold down to expand access to the trunk. Leather seats are still an option. 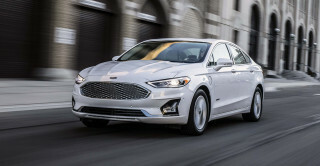 The standard powertrain is a 182-horsepower, 2.5-liter four-cylinder mated to a continuously variable transmission (CVT). Tuned here for higher mileage than ever, Nissan's aiming for an EPA highway rating of 27 miles per gallon city, 38 miles per gallon highway, putting it on par with some hybrids and above leaders like today's standard Hyundai Sonata, rated at 35 mpg highway. It's plenty of power for the point-A-to-point-B school of driving, though the drivetrain can be loud at the higher reaches of its range. Premium Altimas will continue to offer a quick-footed 3.5-liter V-6 with 270 horsepower and 258 pound-feet of torque, rated at 22/30 mpg. They'll also be fitted with the CVT, but with standard paddle controls and a manual shift mode that simulates the gear ratios on a conventional automatic transmission. All versions of the Altima sedan will continue to ride on an independent suspension, and it's upgraded to Sachs shocks for better ride control and a more luxurious feel, Nissan says. They've hit that goal--and coupled with a switch to fancy electrohydraulic steering, they've polished the Altima's road manners to a quiet gloss. The Altima now has excellent compliance over most every surface, but the tightly controlled ride and eager feel dialed into the old hydraulic-only steering have gone AWOL. We miss the more immediate feel already, because it's long disappeared from cars like the Honda Accord. With safety as strong a selling point as fuel economy in the Altima's class, Nissan's updated the sedan's technology to include all the advanced features on the shelves of suppliers. 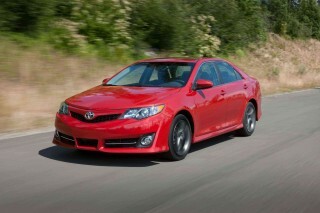 The list will include standard or optional rearview camera, blind-spot monitors, and lane-departure warning systems. The IIHS has already given the Altima its Top Safety Pick+ accolade (with top scores in all but the new small overlap test), while the NHTSA gives it five stars overall for crash-test performance. Finally, on the infotainment front, the Altima catches up to the competition with new bundles of features connected to audio and Bluetooth, which now comes standard on the sedan, as does audio streaming and incoming text-to-voice translation, along with a CD player and an auxiliary jack. The Altima's infotainment system also permits streaming from Pandora, and accepts mapping information from Google Maps, too. A central display in the instrument cluster brings together all this information for the driver to monitor while on the road. Other available features will include automatic headlights; LED taillights; heated rearview side mirrors; a USB port; Bose audio; satellite radio; a navigation with a 7-inch screen, a big step up from the Altima's current small navi display; dual-zone climate control; pushbutton start; a wide-view rearview camera; and a glass sunroof. The Altima sedan is priced from about $22,000. 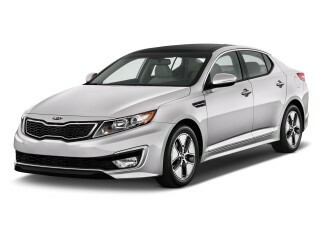 Seven models will range in price up to $30,000. Now in the thick of the family-sedan sales race, the Altima's come a long way since its scrappy also-ran days. It's addressed its shortcomings, and struck a better balance between its formerly taut, lean feel and the premium ride and quietness it now delivers. Meanwhile, the Altima Coupe carries over in a single powertrain configuration for the 2013 model year, and goes away entirely in the 2014 model year. The Altima's evolved once more in a sleek, Infiniti-like direction; the cabin's more mature, with more substantial shapes and clear, simple controls. 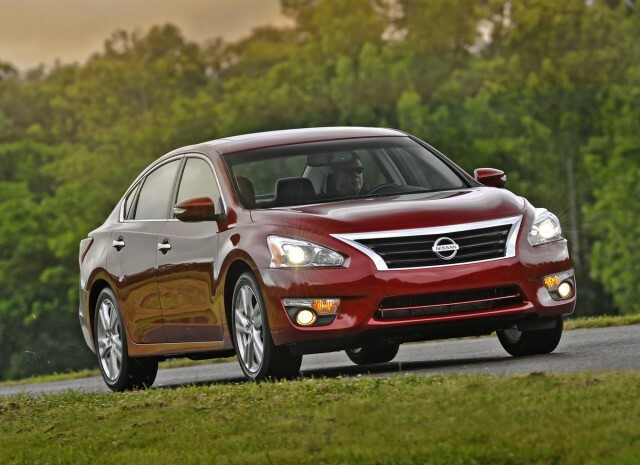 We're sold on the 2013 Nissan Altima's attractive new sheetmetal and its tastefully matured cabin. While past Altimas have taken some interesting silhouettes, then lost the narrative with gratuitously weird details, this one's fully envisioned as an ersatz Infiniti--so much so, it makes us wonder where the Maxima goes from here. The Altima's new shape loosely translates the forward motion of Infinitis and the Maxima into something slightly more mainstream. The complex body stampings--some of the most difficult it's ever done, Nissan says--give the fenders pronounced high points that give the Altima just enough surface interest. The angled, arrow-themed cues of other recent Nissans are reflected in the headlamps and taillamps, and the sidelights gracefully taper to a gentle upkick before they draw to a point. The grille is, thankfully, nothing like the one on the Murano or Juke, just a simple metallic frame that looks like a generations-down iteration of the latest Lexus hourglass theme. The interior stands out in sharp contrast to the sheetmetal. It's conservatively drawn, with straight lines dividing off the center stack of controls from the driver and the passenger. There's also more space left for larger LCD screens for more advanced infotainment systems, a selling point where the Altima's lagged behind the Koreans and Americans. Big dials and a three-dimensionally drawn screen between them fill up the gauge cluster, while the wide center console is spanned by the shift lever, cupholders, some usefully large storage bins, and covered in a decently rendered artificial woodgrain or a back-to-wardrobe metallic print that looks like bad sharkskin material cut on a bias. The finishes are more spendy this time, and more soft-touch plastics meet the hand and the eye--except at the door pulls, where it's hard, wide-grain plastic. It's probably as durable as possible. The manual transmission is gone, and so is the suspension's old athletic feel--but both drivetrains go a long way to changing the CVT's rubberband reputation. The 2013 Nissan Altima stands behind its tradition of four- and six-cylinder engines. But while other family four-doors are dropping the sixes from their lineups, Nissan's doing something a little different, of course, by shedding all the transmissions save for their unique, unconventional CVT. The frugal-minded will love the Altima's base powertrain. 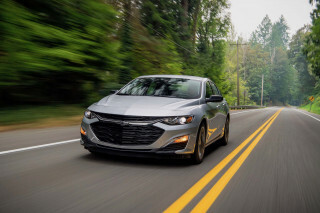 A 2.5-liter four-cylinder with 182 horsepower teams up with a heavily reworked, continuously variable transmission (CVT) for acceleration to 60 mph in the sub-8-second range. The time and money spent on the CVT has helped its responsiveness; especially in sport-shift mode, it's quicker to move around the rev range, making the most of the four's power (and the Altima's light curb weight of 3,100 to 3,400 pounds, among the lightest in the class). The four-cylinder's grown louder than ever, and the volume of engine noise can discourage running it near its power peak, though it's actually smooth up there, for a large-displacement four. The swift Altima is the 270-horsepower, 3.5-liter V-6 model. It's fitted with a CVT too, but to go with its manual-shift mode, it also gets paddle shifters and simulated gear ratios that click the engine down a few hundred rpm once it flies too close to the redline. It's effortlessly smooth compared to the four, very fast (60 mph in about 7.1 seconds), and not too thirsty, at 22/30 mpg, estimated. All versions of the Altima ride on an independent suspension, now upgraded to Sachs shocks for better ride control. The rear suspension eliminates one of its lateral links, incorporating it into a structural brace that creates a wider, stiffer axis for better wheel control. A new Active Understeer Control applies braking to inside front wheels to tighten cornering lines. Sixteen-inch wheels are now standard on the Altima; 17- and 18-inch wheels and tires are available. Along with a change from hydraulic to electrohydraulic steering--now the norm on all Altimas--the suspension changes have tipped the balance away from athletic response to a very well-controlled ride. Nissan says it's gone after a luxury-car level of shock performance and a plush ride--and they've achieved those goals. But the last two generations of Altima sedans have had an immediacy of steering feel and a more tightly damped ride, that made them feel like the sports coupes of the class. Like the Ford Fusion, the Altima was the "other" choice in a class full of softly sprung four-doors. Now it's the VW Passat that has the old Altima's resolutely firm, taut ride, while the Nissan has moved into the Accord realm. 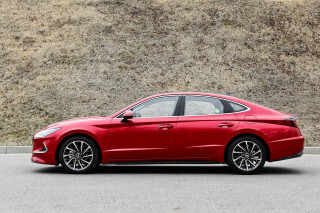 It's demonstrably better in some important ways, and still a few big steps ahead of most other family sedans in handling talents--but it's less enthusiastic about its own talent this time around. Not significantly bigger in any direction, the Altima gets much better front seats, more small-item storage, and an inexpensive piece of trim or two. Still a five-seater and not much bigger in any direction than last year's model, the 2013 Nissan Altima grows a little bit on its 109.3-inch wheelbase to fit neatly in a place somewhere smaller than a Honda Accord and the titanic VW Passat, but bigger than the outgoing Ford Fusion. This year's Altima is 1.4 inches wider than before, and sits at 191.5 inches in overall length. That puts front leg room at 45.0 inches and rear leg room at 36.1 inches, both above average in the family-sedan segment, and headroom checks in at 40.0 inches in front and 37.1 inches in back--an inch less in front when the sunroof is specified. Those numbers translate into a very spacious cabin for four adults--five with some jostling--and exceptional comfort thanks to lots of effort put into the Altima's seats. Better sculpting makes the most of the available headroom--I had more than an inch of space left under the sunroof, though I'm six feet tall and sit fairly upright. More surprising, the Altima's cloth front seats felt just as comfortable after a couple hours of driving. Nissan says it patterned the shape and compression characteristics after NASA's own research--whatever the inspiration, it's paid off in long-distance comfort that holds up even when the seats are covered in leather. The Altima's substantial dash trims a little more knee room away than some sedans, though--the Passat for example. The six-way power driver seat can be upgraded to eight-way control and seat heating, but the passenger side is manual-only on all versions. In back, the Altima has just enough head room to keep tall passengers from making contact with the headliner. The seat is laid back at a fairly steep angle, and there's some, not a lot, of foot room under the front seats. The rear seatbacks are split 60/40, and fold down for access to the trunk. The Altima excels in muting and filtering out almost all road noises. It's far better than the Passat and Sonata, for example, at eliminating the constant tire drone from freeway driving--though it's challenged by the four-cylinder's aggressive, always-present exhaust noise. The V-6 is subdued to a mellow hum, and it's easy to hear the sound system at low volumes, whereas the Passat's stereo has to be cranked up to overcome its significant tire and wind noise. Elsewhere, the Altima's fit and finish is mostly a success, but some trim is better than others. The dash cap is soft and thick, and so are the armrest and those supportive cloth seats. The door pulls are hard plastic; the piano black trim on the dash is the kind that swirls and scuffs easily and quickly; and the radio buttons are metal chiclets of equal size and texture. They look like lesser pieces stuck on a center stack that's otherwise well composed, and mature. Skip the faux-metal trim on some models if you can--it reads like a cheap sharkskin suit. With 15.4 cubic feet of space the trunk is average or a little better than average. Look up ahead of its hinges, though, and it's left unfinished, with exposed speakers, as we've seen in the Sonata. While Ford and Hyundai and VW have moved their seatback releases into the trunk, Nissan's kept some in the cabin--but they've added a thoughtful second set in the trunk, too. To save weight, they're not made of plastic though--they're lightweight fabric loops that weigh next to nothing and probably cost even less. You have to admire the ingenuity, and the bold cost-cutting, all at once. The last Altima missed out on the safety-tech parade; this one marches into lockstep with options for everything from a rearview camera to blind-spot monitors. The Altima had plenty of room for improvement in the safety arena. 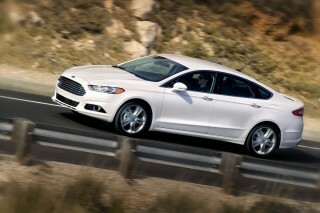 The 2012 model-year sedan earned some good ratings--four stars overall from the NHTSA, and "good" scores from the IIHS for frontal impacts--but its roof strength tests were less convincing, and it lacked some of the latest safety technology and options available on the newest family four-doors. The 2013 Altima's new body structure has paid dividends. Nissan sedan's now earned a five-star overall rating from the National Highway Traffic Safety Administration (NHTSA), with five-star scores in all the major tests and a four-star rating for rollover resistance. Furthermore, it gets top ('good') IIHS scores in all but the new small overlap frontal test--for a great Top Safety Pick+ achievement. The new Altima has more safety gear than ever, starting with the requisite dual front, side, and curtain airbags; anti-lock brakes, traction and stability control; and tire pressure monitors. Nissan uses those monitors cleverly for Easy Fill, a system that lets you put air into the tires until the horn sounds--your signal that the tire pressure's reached the recommended level, no gauge required. While the previous Altima lacked the latest safety technology, the new one raids the high-tech cupboard for nearly every major add-on introduced in the past few years. 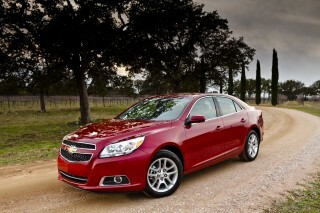 The list will include standard or optional rearview camera, blind-spot monitors, and lane-departure warning systems. All three can be ordered together in a Technology package, bundled with a navigation system. Bluetooth is standard, and the optional navigation system is bigger and brighter--otherwise, the features and options are bundled well, without big surprises. With seven different versions of the Altima split between four- and six-cylinder engines, the new Nissan family sedan would seem to have all the latest features covered. There are some gaps between the models, though, and one or two features not on the equipment list at all. The base $21,500 Altima 2.5 comes with cloth seats; power windows, locks, and mirrors; Intelligent Key with pushbutton start; air conditioning; a split-folding rear seat; manually adjusting front seats; Bluetooth with streaming audio; and an AM/FM/CD player with four speakers. All Altimas also get a new Drive-Assist Display, which replaces the typical trip computer and related functions with a 4.0-inch LCD screen between the gauges, depicting the car--in the correct color--in a 3D-like effect. The display shows information on fuel economy, trip distance, tire pressures, audio functions, and directions when a navigation system is included. On the 2.5 S, Nissan adds a power driver seat; cruise control; six-speaker audio; steering-wheel audio controls; automatic headlights; On the 3.5 S, the Altima also gets 18-inch wheels and paddle shifters with a manual shift mode. On both four- and six-cylinder Altima SV sedans, Nissan fits remote start; alloy wheels; a rearview camera; a more advanced Bluetooth system with inbound text reading and outbound pre-programmed responses for some phones (but currently not the Apple iPhone); a USB port; and satellite radio. This Altima's infotainment system also permits streaming from Pandora, and accepts mapping information from Google Maps, too. The 3.5 SV also adds fog lights, a universal remote, and a moonroof. At the top of the lineup, the Altima SL ($30,080 for the 3.5 SL) comes standard with leather seating; nine-speaker Bose audio; heated front seats and steering wheel; an eight-way power driver seat; an auto-dimming rearview mirror; LED taillights and mirror-mounted turn signals; and heated side mirrors. Options include a navigation system with a larger 7-inch screen, a welcome step up from the last-generation Altima's puny LCD readout; remote start; and a rear spoiler. The model lineup seems complex, but with so many features bundled together, the Altima's actually been packaged for simpler, more efficient assembly. It's also been configured to a target weight and price--which might explain why some versions omit things like rear-seat air vents or even an option for satellite radio, and why no versions can be fitted with a power passenger seat. The four-cylinder Altima's 38-mpg highway gas mileage could lead the mid-size sedan pack until a new Hybrid emerges. Nissan's taken great pains to ensure the Altima meets or beats today's benchmarks in family-sedan fuel economy. 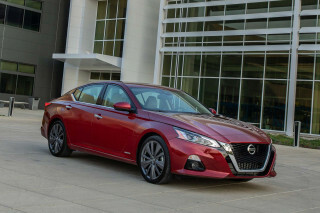 While some Korean sedans are rated at 35 miles per gallon on the highway, Nissan says with its latest transmissions and careful tuning, the 2013 Altima hits that figure--and more. Both the four-cylinder Altima and the V-6 version come equipped with a single transmission. The "Xtronic" CVT (continuously variable transmission) uses a set of pulleys and a belt to simulate an infinite number of gear ratios--on V-6 drivetrains, with some electronically constructed "gears" programmed in along the way for a more conventional driving feel. The CVT has seen progress all its own, with Nissan changing out 70 percent of its parts in the name of efficiency, for a reduction in friction of 40 percent--which helps the Altima along to a 15-percent improvement in fuel economy across the board. 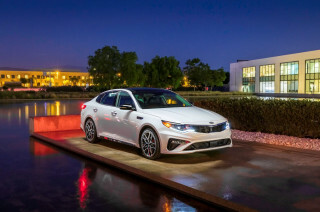 The net for the four-cylinder is EPA-rated gas mileage of 27 miles per gallon city, 38 miles per gallon highway, and 31 mpg combined--or 3 mpg better on the highway cycle than the best four-cylinder mid-size sedan can muster today. With the V-6 and CVT, the Altima is rated at 22/31 mpg, or 25 mpg combined. 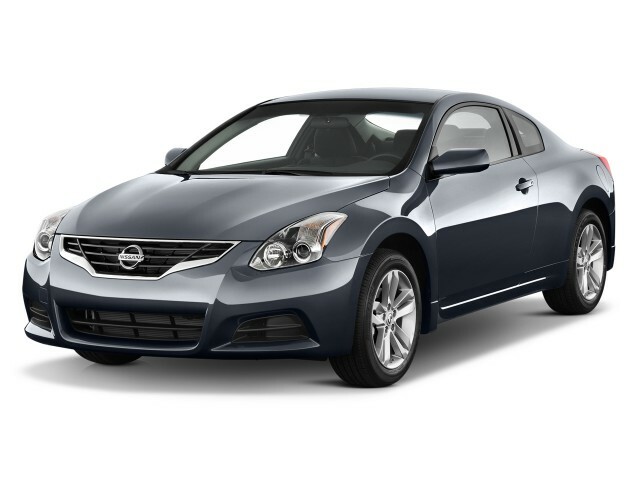 With the Altima Coupe, fuel economy checks in at 23/32 mpg, or 26 mpg combined. I have both a 2013 Altima 2.5 SL and a 2013 Honda Accord EXL. Both cars are very good. I like the accord better because of better gas milage. A smoother ride and better safety features. Have the V6 SL. Very quiet comfortable and roomy. Great accleration and gas mileage. Almost 30 mpg on highway going 75mph. Also great visibility. Looking for a different year of the Nissan Altima?